November 10 2014. Masters Runners to Watch. The top Masters runners in the country are set to converge on Alexandria, Virginia this coming weekend for the culmination of the USATF Masters road championships. The .US National 12 K road race for Masters is the last road race of the season and a chance to cement one’s position in the inaugural year of the Masters Individual Grand Prix. All of these masters athletes are a testament to the will to compete and succeed. Just a few of the many outstanding athletes who are coming are profiled below. Kathryn Martin. The renowned (Kathryn) Kathy Martin, of Freeport, New York, will contest the 12K championship. She is the .US National defending champion for women 60 to 64. Her 2013 time of 48:59 established the American age group record at that distance. That’s flying at any age! Not only does Martin hold the American record at 12K, she holds [or has pending] almost every other age group record from the 5K to the Marathon. Her national record at 5 km was established in 2011 in Syracuse, NY at the national championships. The time was an incredible 19:04! Her pending record in the 10K is 40:10, run earlier this year at the 10K championships in Dedham, MA. Martin also ran a 40:17 at Joan Benoit Samuelson's famed Beach to Beacon 10K this summer. Martin excels on the track as well. She broke the age group American records for the indoor 800 meters and 1 mile run prior to running in the World Indoor Championships this year. Martin has more world class performances than you can count, and occasionally attains 100%. Her record setting performance at the .US Nationals last year graded out at 99.54%. Her pending 10K record grades out, not surprisingly, at 100.42%. Martin is a pioneer among US women born in the 1950’s, setting the standards for younger women who have grown up in a different era for women’s sports, to strive after. A national champion many times over and the 2013 Masters Runner of the Year, the race is honored to have Martin competing. Doreen McCoubrie. Masters runner of the year for the 45-49 age division in 2007, Doreen McCoubrie, of Malvern, Pennsylvania, has performed at a high level ever since. Overcoming the occasional injury, McCoubrie has nonetheless maintained her reputation on the roads. She took first place in her division at the USA 1 mile road championships as part of the CRIM Festival of Races in Flint, Michigan.McCoubrie dominated the race in a time of 5:29. She has taken silver age group medals with world class performances at the USA 10 kilometer championship in Dedham, Massachusetts with a time of 39:01 [age grading 90.32%], and at the USA 5K championship at Syracuse, NY with a time of 18:49 [age grading 91.36%]. The .US National Race will be her longest test in a national championship this year; it promises to be a good one. Jennifer Rhines. One of those younger runners who will eventually be striving to overtake the records set by masters runners like Kathy Martin, is three-time Olympian,(Jennifer) Jen Rhines, Boston, Massachusetts. Rhines’s incredible career includes competing in three Olympic games at three different distances: 10,000 meters (2000-Sidney, Australia); the Marathon (2004- Athens, Greece); and 5000 meters (2008-Beijing, China). To put it in context, the 2012 Olympics in London were the first games in the new millennium where the US Olympic team did not include Jen Rhines, an astounding fact and a tribute to her ability to perform at an elite level over an unusually extended time period. In her first few months as a masters runner, Rhines has already broken the decade old 10K Masters record of former Olympian Colleen DeReuck. At the USATF National Women's Club Team 10K Championships in Boston on October 13th, Rhines lowered the previous record of 32:50 by a huge 17 seconds, coming home in 32:33. What an incredible accomplishment! Rhines will be competing in the elite Open competition. She is going after open rather than masters prize money. Nonetheless, she is eligible, by age to break a masters record if she can. No doubt Rhines has her eyes set on taking Colleen DeReuck’s 12K record of 40:48, established in Spokane, Washington in 2004. Doug Goodhue. Affectionately known as the Silver Bullet, Doug Goodhue, of Milford, Michigan has dominated his age group for years. Each year from 2006 through 2013, Goodhue, has won the title of Masters Runner of the Year for his age group. That is an incredible string and no one expects it to be broken in 2014. This year Goodhue has won five age group titles on the roads at distances from 1 mile to 15K, not to mention a 5 km USA Cross Country title last weekend. His 32:15 8K championship in Brea, California grades out at 92.14%, suggesting he should be in the hunt again for an age grading place in Alexandria as well as being the favorite for another age group win. Last year he ran 49:20. It appears the fastest time run by an American man over the age of 70 was 48:57, run by Warren Utes in 1995. Can Goodhue find another 24 seconds? Stay tuned. Lloyd Hansen. On the masters scene for several years, this has been a breakout year for Lloyd Hansen, of Salt Lake City, Utah. He has five US titles to his credit this year, the 5K, the 8K and the 15K on the road, in addition to cross country championships at 5K and 8K. That is not to mention his track titles at the Outdoor National Championships at the 5000 and 10,000 meters. He has an 18:08 to his credit at the Hollis 5K in New Hampshire and a 1:22:25 time at the Hobble Creek Half Marathon in Utah. Hansen has displayed incredible range this year and the 12 K falls right in the middle of his range. Hansen appears prepped for a top performance in Alexandria. Tom McCormack. A member of the famous 'Irish Brigade' that put East Tennessee State on the distance running map in the 1970's, Tom McCormack, of Johnson City, Tennesse,e burst onto the Masters long distance running scene last October at the 5 kilometer Cross Country Championships in New Jersey. He won that race, rana world class time, and finished second in the age grading to the Masters Runner of the Year, Brian Pilcher; he has not stopped since. 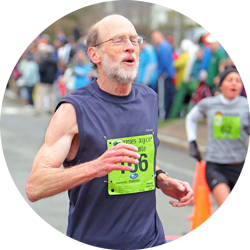 The defending champion in the 60 and over division of the .US National, McCormack took first last year in a time of 43:04 for the top 93.79% age-grade over all of the masters runners, which included several past Masters Runners of the Year. What a road-racing debut! This year has been even more spectacular. He made his first splash in taking the title at the USA 10 KM championship in Dedham, Massachusetts in a time of 36:02. He followed that up with track titles in the 5000 and 10,000 meters at Winston-Salem, NC lapping some pretty impressive master's runners along the way. Then he turned his attention to Syracuse where he would present us with a record-breaking performance. The 5 K road record for runners 60 and over had been held at 17:00 by Jim O'Neil since 1986. Over the ensuing 27 years, many stellar runners had lined up at the Carlsbad 5K, where it was set, and at the Syracuse Festival of Races, another home for record performances, and none had succeeded. Despite the somewhat somewhat windy day, McCormack blasted away from the starting line and did not stop until he had blazed his way to a 16:58! Alexandria is proud to welcome its defending M60 champion, overall age grade champion and new USA 5K record holder! Brian Pilcher. Last year's Masters Runner of the Year, Brian Pilcher, from Ross, California, tore up the roads in 2013. He won his age group at every distance from 5K to the Half Marathon, with world class performances every time. The highlights were his 16:22 5K at Syracuse for an age-grade of 95.54% and his 1:15:33 half marathon at Melbourne, Florida (for an age grade of 93.40%). Not surprisingly, he is the defending age group champion for the .US National race. Last year he sped through the course in 42:03 for a 93.57% age grade. The year 2014, in contrast, has been a year of injury, recovery and gradual re-establishment of fitness and competitiveness. Beginning the year with an injury, Pilcher did not attempt a national race until he had tested his fitness a couple of times on the road at the end of the summer. In October he entered the national 5K road championships at Syracuse and started to find his legs. Although not as fast as last year, no one was taking Pilcher for granted. Later in October he entered the national 15K road championships in Tulsa and, for the first time in 2014, made the podium in his age group and in age grading, with a second place finish. His fitness appears to be peaking for this upcoming weekend. It is probably too much to hope that Pilcher can match or better his performance at the .US National race of a year ago but it will be fascinating to watch and find out. He is the 'comeback kid' for this year's race! USATF learned today [November 13] that Pilcher will not be contesting the championships in Alexandria after all. We hope this is not a sign of a relapse or other injury. In any case, we wish Brian a speedy and complete recovery and look forward to a fantastic 2015 running year from him.